Oh Lord, how awesome are your ways! When we give our lives to you, we are transformed into a new creation. Our old life is gone and we become brand new. We start all over again with the Lords forgiveness, and don’t have to wallow in the past, no matter what it may have been. It truly is being Born Again. The caterpillar who crawls along on the ground and eats on the leaves for its sustenance, lives its life very meagerly. But then it is transformed into a butterfly who flies freely thru the air landing on the flowers and drinking the nectar for its sustenance. 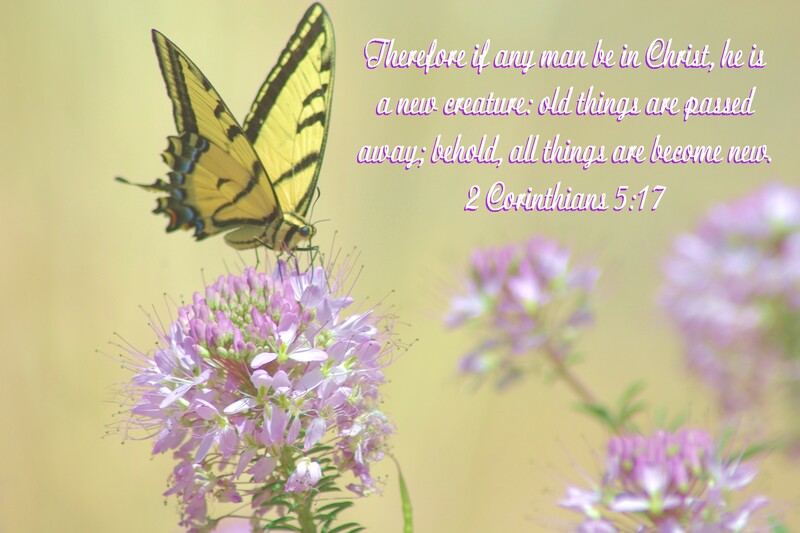 Thank you Lord that we can become new creations by following you. I’m a butterfly! I love trees, and the life of a tree.They have so many stories to tell. We know the age of a tree by the rings in the trunk. At a park in northern California, a trunk is displayed that has each ring labeled. I could have read for the longest time as the tree was 500 years old. It told of many presidents, inventions, such as electricity, wars and treaty’s, and so much more. A tree in Sequoia National Park called the Grizzly Giant was a sprout in 1500 BC. I believe the oldest known tree is 5000 years old. The tree in the sand todays featured photo is one I am sure I played around as a child at the beach at Lahonton Lake in Nevada. I returned as a grandma and found this twisted and still living tree. It adapted no matter what its situation was. It was far from the water at this time as the lake was nearly dry, but the tree lives on. 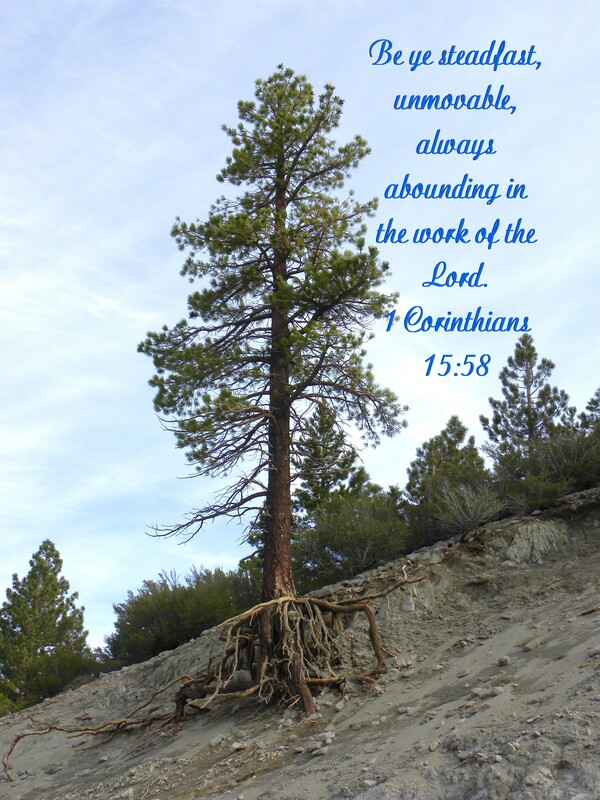 The other pictured tree is one near Lake Tahoe, erosion has exposed almost all of the roots, and the tree holds on. In life we will go thru many changes. Good years ,and bad. The winds of change might try to blow us over, or wash us away but we have to stay steadfast , always abounding in the work of the Lord. Doing this will keep us standing straight and waiting until that glorias day when we go to meet the Lord. There is great value in morning prayer. The world is quiet, the head is clear,a wonderful time to be alone with the Lord. I find it is the best time for me to pray, and even write. David also thought it was a perfect time as he wrote this Psalm. “Give ear to my words oh Lord, consider my meditation. Hearken unto the voice of my cry, my King, and my God; For unto thee will I pray. 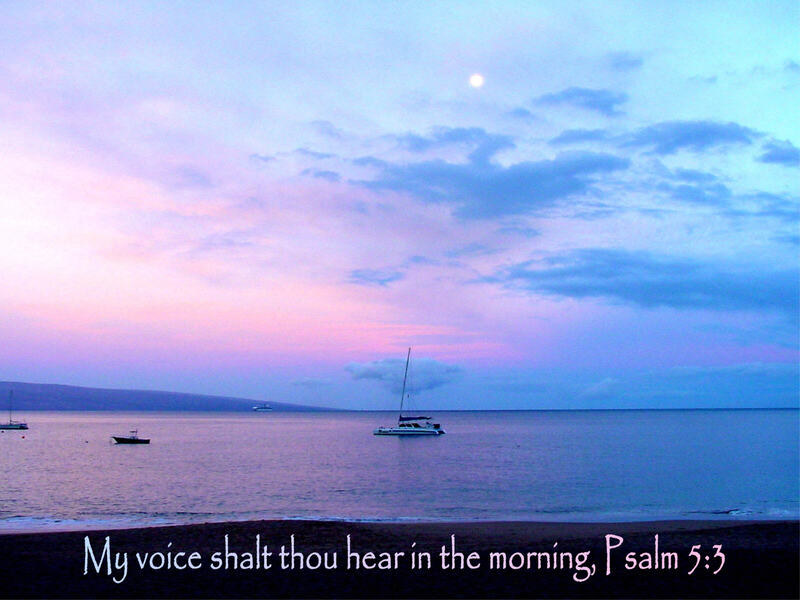 My voice shalt thou hear in the morning, O Lord; in the morning will I direct my prayer unto thee, and will look up”. Psalm 5:1-3 You can almost hear David himself singing that prayer. I once went to a Church where the whole choir walked in down the middle aisle singing that song to start our service. A wonderful way to start a sunday morning worship service. More than that it is a wonderful way to start all of our days. Look up, and pray to the Lord. He is waiting for your voice! I am learning many things on the journey that I am on. I have cancer, but I don’t want it to be a downer. I like to say my name is Darlene,not cancer. I am now experiencing exhaustion . I am one who really never sat down too much, and now I find my self getting so weak, I have to lay down and rest. I fought it and had fear about it, and finally went to the Lord about it. 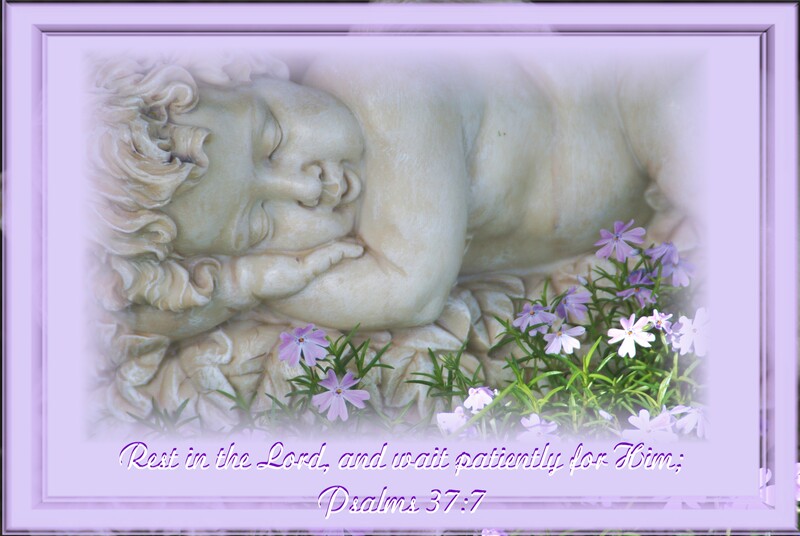 Throughout the Bible there is teaching on REST. There are so many things that steal our rest, and it seems its one of the first things man gives up in stressful times. The Lord says in Matthew 11:28-30 “Come unto me, all ye that labour & are heavy laden, and I will give you rest. 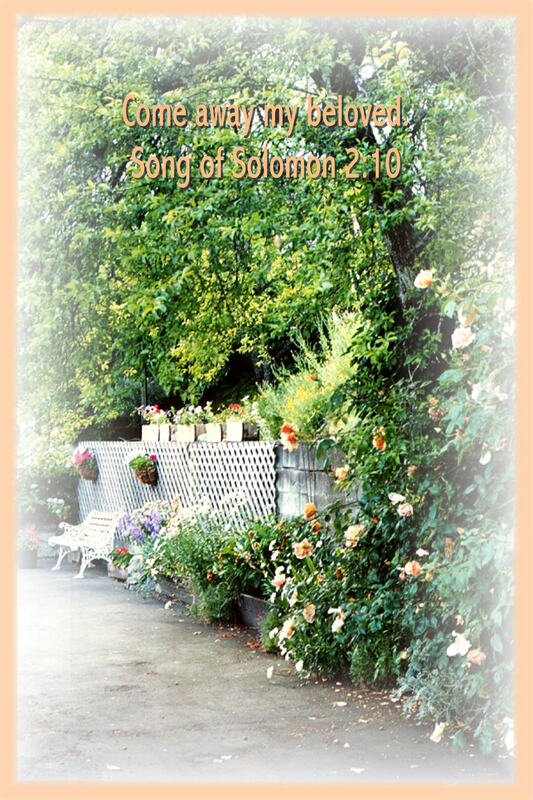 Take my yoke upon you and learn of me; for I am meek and lowly in heart; and you shall find rest unto your souls. For my yoke is easy, and my burden is light” many of us are carrying heavy burdens. Whats heavy to one person might not be heavy to another. No matter wat we are carrying the Lord is there to give rest to our soul. Take the yoke that the Lord provides and learn from him. His yoke is easy and his burden is light. Don’t try to figure it all out or try to do it yourself. Rest and wait patiently for Him. He has it all under control. Don’t ever fight taking a rest. It is good for your soul! No one ever said life would be a bed of roses, I think we can give that a big Amen! But being a Christian and walking with the Lord sheds a different light on the lives we live. We are living for Him and in love with the Lord no matter what the hardships may be. We are very often not understood. It is hard to wrap your mind around how difficult it is for non-believers to believe. We are Christians and people who are not of God don’t hear us. Some times it may feel like the only persons that listen are Christians. The people of the World,(not Christians) talk about the world, and can’t hear what we have to say, often times calling us an offence. These people also find the Lord to be an offence. The scripture for today, is very clear about these very things. 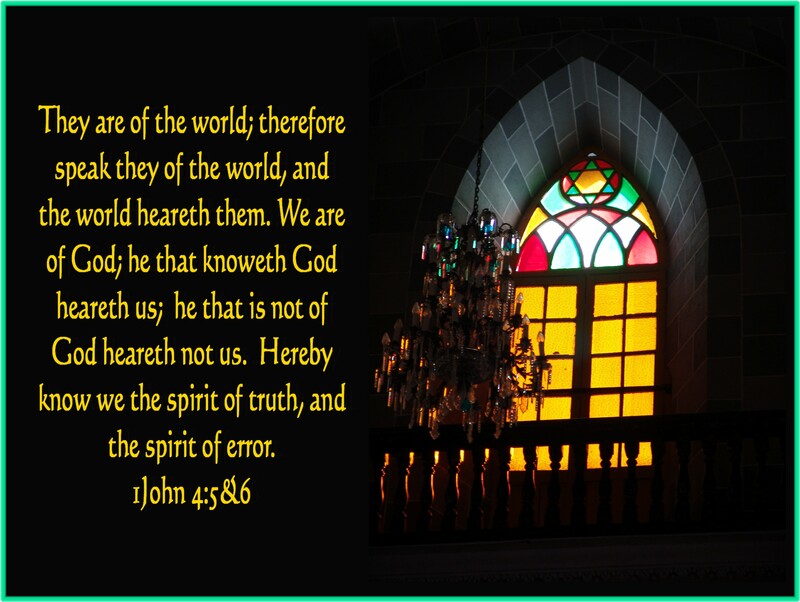 I’m proud to say that I am of God, and I know the spirit of truth ,and the spirit of error. Feelings of frustration, sadness or stress, things that can start shaking our faith. Getting too busy to take the time to stop and talk to the Lord. He is waiting for us you know. There are times when we just need to get away from what ever is tearing at us. Its time to run to the Lord and have quiet time with Him. It can happen in the den, yard, or bedroom, but the greatest thing is to run away with him for a little while and just sit at his feet. We find our peace there and get our feet back on the path following Him. The photo today brings a strong memory to me. It was in Victoria, Canada that I took this photo. I remember walking the grounds of where we were staying and spotting this lovely place to sit down. Peach roses, white bench, flower pots everywhere! I thought this is a perfect place to sit down with the Lord. The Lord called me to that place, and time. I will never forget it. My daughters and I were on a girls trip. We did that allot before they all got married. I highly recommend it for mothers and their daughters. This was a very bad day for me. There was good news and bad news, Im sure you have all had days like that. Those of you who follow me know that I have incurable Renal Cell Cancer, kidney cancer moved to my lungs. I have been in treatment for 3 months. Three hard months.! I had a three-month scan to see the progress if any from the drug I am taking. The Name is Votrient. I have been on the highest possible dose and have had numerous side effects. They have literally been life changing side effects. I was eager to see the doctor to find the results. I wanted a miracle I guess. Well I had good news. The cancer in my lungs of which I have three, have shrunk in size. The cancer in one lymph node had shrunk, and the other affected lymph node had stayed the same. They found no cancer that had traveled. All good ! I asked can I come down on this horrible medicine? The doctor said no. He said if I hadn’t taken this medicine three months ago the cancer would be throughout my whole body. It is very aggressive. I asked if it would shrink more, he said no. I was blessed that it had been knocked back like it was. I said will I ever be able to taste food again? He said no. Will I ever quit being so exhausted? He said no. I asked about numerous other symptoms and he said no. This is your new life. That was the bad news. I know I have to accept what it is and Praise the Lord that I am alive. I am grateful to the Lord, I love Him no matter what, but I have to say it isn’t easy. Then I read the above scripture and was filled with comfort and peace. He will be there with me , what more can I ask. I think it just took me 3 months to really get it. 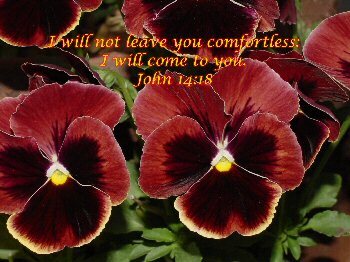 But I feel comforted by my Lord and Saviour Jesus Christ.